Hotstar Annual Plan Offers: The Hotstar is offering an annual membership plan at Rs. 1,200 for a limited time to new subscribers, a staggering 50 percent off, given it costs Rs. 199 per month. That’s one of two “special offers” the Star India-owned streaming service is currently running, alongside a 9-month Rs. 999 offer, which saves you about 44 percent. The new plans are available via Hotstar.com. Both these Hotstar Annual Plan Offers are only applicable if you pay with a debit card. The Rs. 999 offer is only available until September 12, as it’s targeted towards viewers of the Premier League, and Bundesliga, what with the 2017-18 football season gearing up. We’ve reached out to the Hotstar India for comment on whether there’s an expiry date on the annual Rs. 1,200 plan as well, the reason behind the debit card limitation, and whether existing subscribers can avail these Hotstar Annual Plan Offers without having to cancel their ongoing subscription. Until now, the best way to get a Hotstar subscription used to be via iTunes billing, as Apple’s restrictions meant it cost Rs. 190 per month. 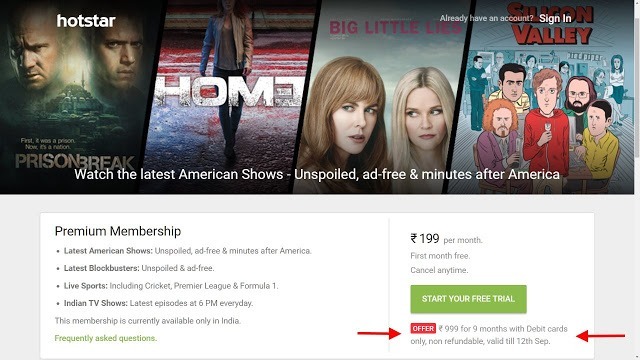 If you’d been holding out on Hotstar owing to price, there won’t be a better time to opt in.